FanDuel always looks to create new experiences for its customers, and that is definitely the case with their Brackets Contest. 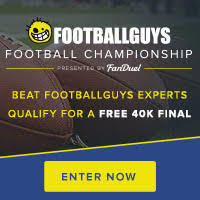 The 64 qualifying entries will be placed in a head-to-head bracket style tournament (think “March Madness”) where every week half of the field will advance. Qualifiers will run throughout October with the 64 teams all paired up for November contests through the bracket elimination portion of this contest. The two teams still standing after November 29th will head to Las Vegas for a live final where the winner will walk away with $200,000 and the “loser” only gets $100,000. Not a bad way to leave Las Vegas. Look for qualifiers starting this week for as little as $5 an entry. Once again, I'm in, and I think most DFS NFL fans should be too.